Ha Long Bay is the most popular travel destination in Vietnam, and just glancing at a friend’s travel photos will show you why. The emerald-green waters, verdant mountains, grottoes, and spectacular limestone islands sprinkled throughout the bay beckon tourists from all over the world. In this UNESCO World Heritage Site, there are so many ways to take in the beauty of this area: boat cruises, kayaking, scuba diving, hiking, cave exploration, swimming, and shopping. The scenery in Ha Long Bay (sometimes spelled Halong Bay) is spectacular and majestic, with gorgeous monolithic islands in a calm bay. There are approximately 2,000 tiny islands (steep limestone islands with lush vegetation on top), some of which contain lakes and caves. Most are uninhabitable and difficult to explore except by boat. A few are large enough to explore by car, and have hotels, resorts, and restaurants. The larger, inhabitable islands include Dao Cat Ba, Dao Tuan Chau, Tra Ban, and Ngoc Vung Islands. Dao Ngoc Vung is along the shoreline of the bay and has one of the most beautiful beaches in the area; in addition, you can rent primitive beach huts here. One of the most popular ways to explore the rock islands, hidden beaches, and scenic beauty of this area is with a hospitable cruise tours. Because there is so much to see, most people opt for one of the many popular 2-3 day boat tours with a private sleeping cabin; however, single day excursions are also available. Longer boat tours give you a chance to explore some of the famous floating island villages in the bay and several of the area’s celebrated caves. Adventure-seeking and active travelers enjoy hiking, kayaking, snorkeling, swimming, and spelunking. Cat Ba Island is the largest of these limestone islands in the Ha Long Bay (Cat Ba Island is 354 sq km, or about 220 sq. mi). It is located roughly in the center of the bay and has hotels, restaurants, a national park, and many interesting tourist features. Cat Ba National Park is a lush park with mangrove forests, lakes, and coral along the shore. The park is most often explored by bike or by hiking (trekking), but there are a few roads and tour buses also available. It is home to the critically endangered Golden-Headed or Cat Ba langur, and Cat Ba island is the only known place where this primate is known to live in the wild. To get to Cat Ba island, you have three options: you can take a ferry from Tuan Chau Island, a group junk boat ride from Bai Chay, or embark on a group boat ride from Hanoi. 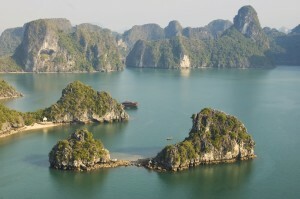 Many boat tours in Ha Long Bay also stop at Cat Ba Island. 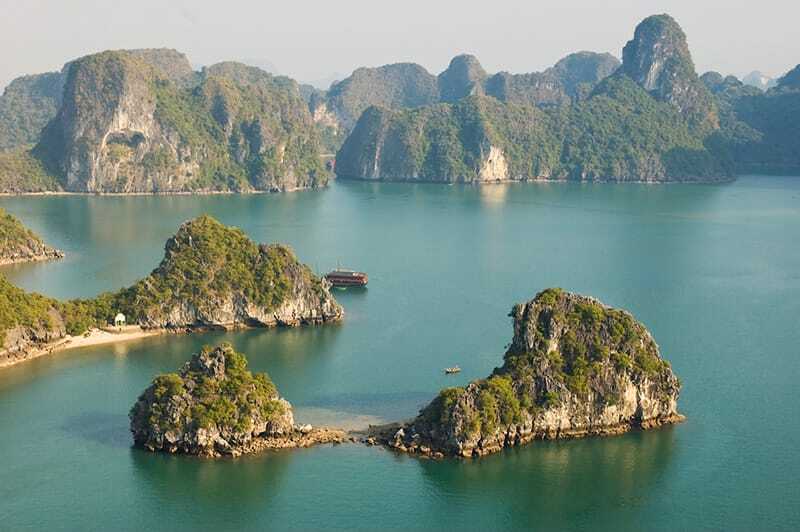 While in Ha Long Bay, you’ll have ample opportunity to enjoy the area’s famous seafood. Prawns and snails are some of the area favorites, although many types of seafood abounds in this area and cooking techniques are highly regarded. A few specialty tours even offer cave dining experiences, where you can sample the local cuisine in one of the area’s romantic caverns, complete with fine table linens and candlelight. However you choose to enjoy this natural wonderland of clear water, caves, forests, and adventure, you will find scenic beauty that’s unparalleled throughout the world. If you’re traveling to Ha Long Bay, Vietnam from outside of the country, make sure you have your Vietnam Visa well in advance of your travel. Getting a Vietnam Visa is a simple process at Vietnam Visa. Once you have a few details of your stay worked out (how many months you’ll be staying, and an address of a hotel), apply now for your Vietnam Visa. Processing usually takes 2 working days, with faster expedited options also available.